The information given below is taken directly from Kabuki21: "The scene is the center of Edo's licensed red light district. Cherry trees are in full bloom against a hazy spring evening. In front of Miuraya Teahouse are several courtesans who are awaiting their celebrated colleague, Agemaki. They accused Agemaki of being drunk. She protests, but stumbles, and her attendants make her drink some sobering medicine and lead her to a bench to rest. A letter has been delivered to Agemaki. It is from Sukeroku's mother, who tells Agemaki to cast off her son, because he is supposed to be avenging his father's murder, and that it is no time for him to come constantly to the licensed quarters and waste his time in unseemly brawls. But Agemaki loves Sukeroku so deeply that she cannot bear to pass a night without seeing him. In the meantime, one of Agemaki's attendants comes, announcing that the elderly samurai, Ikyû, is on his way to visit her. He has been a slave to her love. Shiratama and other ladies in the district enter and Ikyû, followed by his retainers, comes. He is a vicious old man famous in the quarter for his huge white beard, but he has money and is one of Agemaki's best clients. Ikyû at once begins to abuse Sukeroku, calling him a thief. Agemaki admits that she is perhaps foolish to be in love with Sukeroku, but calling him a thief is too much. Although Shiratama tries to calm her down, Agemaki declared that she will never have anything to do with Ikyû again and withdraws, followed by Shiratama and her attendants." These two prints and one other from the Lyon Collection show prominent actors posed before an archery target. 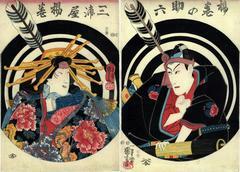 They are said to represent figures from the play Sukeroku kuruwa no hanamidoki. There is a similar print by Toyokuni III in the collection of the Tokyo Metropolitan Library - but with some difference. In this case, there are two actors represented together before an archery target with the arrow feather facing the other direction. Also, there is no identifying script above the target. However, the similarities with the three prints in the Lyon Collection are too great to ignore. Even the publisher is the same. A curatorial note from the Freer-Sackler Galleries notes that "...an arrow hitting a bull's-eye, [is] a symbol that was hung in the towers of kabuki theaters to indicate a "hit" play." in that one place where they met."